A "soldier" Creeping Eye frame pictured on the left is just at 5 bricks high while the "soldier" Orange Squadron on right, is at around 8 1/2 bricks high. Since both frames are "soldier" frames, they would have the same stats. Yet one is condierably larger than the other one. 2 models of the same stats but with a considerable difference in size could present a consistency and cover issue. 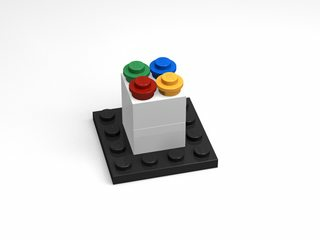 When I personally build my models I like to try and build them in between the red and blue height brick (Over 4 bricks high and below 8). 4 bricks and below should probably be played on a different scale. I would like to possibly suggest that since there is such a wide variety of frame sizes, that perhaps different sizes in frames give different buffs and nerfs. For ex. A frame 6 bricks or less gets a speed buff, but power nerf. A frame 7-8 bricks high has no buff but no nerf. And a frame 9-10 bricks high gets a power buff but a speed nerf. Does it make sense that frames of such a variety of sizes have equal stats? Ideally, everyone playing on the same table should use roughly the same scale/size. If you dig through the fan created rules section you will find plenty of size class rules suggestions, but I'm not sure if any was ever actually game tested. Another functional roadblock to reconciling scale differences on the table is "threat range." Bigger frames are able to command more volume of the battlefield because their capture, melee, and direct fire radii start further out than smaller frames. This is typically a nominal difference when playing at similar scale, but combining 7p and 4p for example would leave the 4p player(s) at a disadvantage because they'd have to travel further to threaten the same area. In my experience, it simply should be avoided when possible. Being larger can work against you, though. You're more likely to be within your attacker's desired range, and it's me difficult to move around cover. Without a green, you might not be able to fit through gaps that smaller frames can. We often set up forested areas where this would matter. But I still wouldn't really recommend it. These advantages and disadvantages don't end up adding any meaningful tactical depth. Thank you all for your comments and thoughts. CmdrRook wrote: Another functional roadblock to reconciling scale differences on the table is "threat range." Bigger frames are able to command more volume of the battlefield because their capture, melee, and direct fire radii start further out than smaller frames. However, I am curious, shouldn't the distance be measured from the overhead center of the frame to the overhead center of the target? If that is the case, then how would the "threat range" be effected by the size (as long as it's within the accepted parameters and the same scale:7p, 4p, etc.) of the frame? Blorf wrote: But I still wouldn't really recommend it. These advantages and disadvantages don't end up adding any meaningful tactical depth. The tactical advantage is to mirror the same kind of tactical advantage in every 'beat em up game' that has the Fast, Mid, and Power fighters. The Fast fighter - is usually smaller in size, faster movement and/or attack, less capable or taking hits/less power. The Middle fighter - is balanced. The Power fighter - is usually larger, slower, more likely to get hit, but can take a hit, and dishes out more power. Those kind of mechanics provide a rather large tactical advantage to the 'beat em up' game. Could not a similar mechanic style be provided in this game as well? Perhaps along the lines of a light, mid, and heavy class frame, all within the same scale? VitorFaria wrote: Ideally, everyone playing on the same table should use roughly the same scale/size. KungFujiApple's Orange Squadron Soldier (viewtopic.php?f=12&t=7878). From what is being said, is it true that neither of these frames should take the battle field against each other because of the size difference? KungFujiApple wrote: However, I am curious, shouldn't the distance be measured from the overhead center of the frame to the overhead center of the target? If that is the case, then how would the "threat range" be effected by the size (as long as it's within the accepted parameters and the same scale:7p, 4p, etc.) of the frame? Measurements are done from any part of the frame to any part of the target. This makes it easy and keeps away from bad-faith measurement arguements. Be careful with the muzzle of that sniper rifle! KungFujiApple wrote: The tactical advantage is to mirror the same kind of tactical advantage in every 'beat em up game' that has the Fast, Mid, and Power fighters. All of these archetypes are created by blending systems. Dedicating system space to any one type of system takes up space needed for others. Fast- - No armor, less capable of taking hits. Fast. Etc, etc. for spot and artillery combos. KungFujiApple wrote: From what is being said, is it true that neither of these frames should take the battle field against each other because of the size difference? Do the larger models fit "the box?" Then it's probably okay(?). There will always be some variation in size, and play groups should avoid being too disproportionate, but it is more of an art than a science. Or, to put my point another way. Would it make sense to assign it a size class? Atavism wrote: Measurements are done from any part of the frame to any part of the target. This makes it easy and keeps away from bad-faith measurement arguements. It would seem to me, that measuring from "any part" of a frame to any other part creates the potential for more bad faith. You yourself gave an example in regards to the length of a weapon. Or why not just outstretch the arms on all your figures to get a few extra bricks of range? The problem I feel with "any part" to "any part" is that it can be too subject to interpretation and design. That's a pretty neat looking frame, but the reach alone is ridiculously long with those weapons.... And it has 4 arms so it has reach in all directions. Does that seem balanced? Atavism wrote: All of these archetypes are created by blending systems. Dedicating system space to any one type of system takes up space needed for others. Etc, etc. for spot and artillery combos. . I understand how you can build fast, mid, or power frames from stats alone, but one of the main issues to address is the varying size of frames used on the battlefield. To reference again, the example of the picture at the top of the forum. The small frame can have the same exact stats as the larger one. From a game aspect, that is played in 3 dimensions, does that make sense, factoring in cover, terrain, etc.? Atavism wrote: Also, I've said this a number of times, the reason frame design is so flexible/standardized is to discourage needing to build any particular kind of thing. Have fun designing fun robots! Or anything else you want! Is this a Lego frame designers pageant, or a tactical table top game? If it is the latter then I feel there is an overwhelming need for a more consistent base standard in frame / field design, and player rules. Creativity is important, however would it not also be equally as important when playing a table top game to have specific universal standards, regulations, and sizes? Please understand I am not meaning to come across as being argumentative, I am just asking and reasoning in an open discussion. The key word is accessibility, we usually value it above strict rules. Frames are as big or as small as players agree. I frankly believe that we don't need much more than that. Heck, one of the best MF0 matches I ever had involved deodorant cans as stations and a Darth Vader statue as one of the frames. You seem to see a problem where most of the community see a key feature. Well that may explain why the community is rather small considering its potential, and why it is so hard to find people to actually play the game. After this forums conversation I'm really not sure. And lets be reasonable, having a "consistent standard" is different than "strict rules". I'm sure you can reason how having a lack of specific standards can become a liability and not an asset. Especially when considering where something is going and how something is progressing. So I submit the question, where is this game going, and how is it progressing? KungFujiApple wrote: Well that may explain why the community is rather small considering its potential, and why it is so hard to find people to actually play the game. MFZ is a niche game and it's hard to find players for a niche game. People post Frame designs because it's easier than posting actual play reports. Most people want to play rather than take notes for other people to read. KungFujiApple wrote: And lets be reasonable, having a "consistent standard" is different than "strict rules". I'm sure you can reason how having a lack of specific standards can become a liability and not an asset. Especially when considering where something is going and how something is progressing. At this point, Mobile Frame Zero is fifteen years old. It is a stable platform with a solid fanbase. New players is always better, and the massive bump when the first Kickstarter dropped was appreciable, but massive and constant growth is unsustainable over time. Ok, so to put it in simple terms, what your saying is your happy at exactly where this game currently is? No need for any more updates, adjustments, or progress? 1) There is no issue with Cover as Cover is set by it's own standards and has nothing to do with a frame's height. 2) Personally I don't think the game needs size classes, partially because there could be debates about something qualifying for said classes. 3) I am probably one of the biggest advocates for keeping certain aspects standard (The Box) but we all have to be flexible given the very nature of this game. 4) When it comes to measuring, Systems are not frames and very much about the body of the frame, sometimes what I call the core like when it comes to the book ijad frames. Just have to use some common sense and make sure everyone at the table is on the same page. I will admit, this could use some more defining in the book. 5) This is both a LEGO Table top with a focus on Piloted Robots BUT it is also a use whatever you want game. 6) As someone who has been at this for quite sometime; I am pretty sure we will always be small, indie and it very much the LEGO I think. The build it, design it yourself thing isn't for a lot of people. KungFujiApple wrote: Ok, so to put it in simple terms, what your saying is your happy at exactly where this game currently is? No need for any more updates, adjustments, or progress? Better Rule Layout, More Fluff (I take an entire book on just that), Better/Refined clarification of some rules....that is all I want really from a '2e'. That would be nice, but would others agree with you? Yes and No; such is the human exprience. Though seriously there are some that desire some more complexity (some more than others) and those that just want clarification or slight tweaks; this will always be the case. We have had some talk about this on The University the other day given Joshua HINTED at the POSSIBILITY of another run of 001. I can’t speak for him but I think I have a good idea of what to expect. ... having a lack of specific standards can become a liability and not an asset. I've played lots of different games with LEGO, both Lego driven ones and skirmish miniature wargames. The thing I've noticed is that what gets posted online even about miniatures isn't the game. Seriously. Google something like W40k. You'll get tonnes of beautifully painted models, the odd battle report, lots of tips on how to paint or assemble your force. What you will rarely get is actual playing of the game. Because that's something one does rather than simply watches (or posts). This forum (and others) is a designers pageant. The game, I'd suggest can be a "use whatever you want" game, but like any game anywhere, is better if played with pieces that add to the story rather than distract from it. The categories aren't mutually exclusive, and don't completely encapsulate the game either. The key point to make is that isn't actually one game at all. Sure there's one set of rules and some common social groupings to online. But the game is played locally. Usually between groups of friends. Friends will develop house rules, expectations, share frame designs and parameters, will set their own standards where needed. There will be history and narrative and most importantly, fun. Because it's a game. Something people do to relax. This isn't to denigrate it in any way. Fun and relaxation are important. Playing together is an vital social activity. So. To answer the question, where is the game going? Answer it yourself, amongst your friends and local players. How is it progressing? Draw more people in, build local community, progress that way. Generate standards and expectations yourselves. And have fun! If someone showed up with a rock and a scrap of paper I would afford them all the dignity and enthusiasm as I would the greatest builder ever, because that's obviously all they have to play with and they have already overcome the incredible embarrassment of showing up with colored rocks. There is a standardized rule for scale, it is "the box" supplemented by a micron of common sense and a ton of good natured fair play. And it is that vague so two people who don't know each other well can just grab their old toys and play. Or a die hard master builder can play with the kid down the street who has three mixels. Or the girl who loves Gundam can fight the guy who loves walruses. From a game perspective, that all makes perfect sense because the models merely represent abstract mathematical golems that throw dice at each other. The frames exist to help us keep track of them (because they are invisible). I love this game exactly like it is and would change almost nothing. Playing it is a blast. Playing it is intense and tactical and strenuous. Designing frames as fun and sometimes hilarious. The community is the best on the internet period. The fact that Joshua hasn't overthrown Games Workshop is the rest of the world's loss, not evidence that there's something wrong with our Big Shooty Robot Pageant. I was going to write a big reply here as well, but Atavism, as usual, expressed almost everything I feel much better than I would. Quoting Joshua, this is the machine that kills fascists. I'm sensing a seriously non conformist vibe and distain toward the mainstream table top gaming industry. And hey I get it, your talking to the guy who does what he can to avoid spending money at the mainstream coffee conglomerate ( I won't say who, but it starts with a "star" and ends in a "bucks"... As in "bucks" is all they care about ) because he feels it's ridiculous to spend double the money on subpar quality, when the local guy can make something way better, with actual personality. And don't misunderstand me, I'm not asking to "fall in line" or "sell out" to the industry. I'm simply asking questions and offering suggestions on how to better improve on something. Improve so that potentially more people than just a niche community can enjoy it. I feel an idea and concept like this would appeal to a lot more people if, when they invested into it, they knew more specifically what they were getting and how to use it. For example: Would blackjack have the same appeal if the winning number was different from casino to casino? Or if you could include your own Pokemon cards and say that pikachu represents the ace of spades? However I respect the community for what it has done, the overall nice atmosphere and attitudes, and it's creativity. In the end, the reasons why these topics were even brought up was because of my fondness for the game, universe and concept behind it. And a desire to see it grow and progress. I will say this though, since sharing and displaying our designs is a main factor in this website, could the website be reconstructed in a way to better display and find our posts and pictures. For example: In just the Mobile Frame Forge; Frame Design alone, there are currently over 3,000 topics buried behind almost 27,000 posts. Realistically speaking much of that information is probably seldom looked at beyond the first 5 pages of the blog. The rules as they are are super distilled, out of necessity (printing cost), and everything that could be pared away and discarded as extraneous was. To fundamentally alter even the small reference to play with what you have, or how to accommodate a larger or smaller scale would thusly make it less MFZ. That said, any game is played with trust and accommodation. If you don't like a thing, and your opponent doesn't like said thing, change it. Anything that lets you enjoy the experience more is indisputably worth your time. Play test your rules and get back to us with the results. If you can market your idea well, it'll spread. Lord knows, I've tried. One of these days, I might even get it right.